Sagging American and Canadian retirees aren’t the only ones getting facelifts in San Miguel de Allende these days. The Museo Historico de San Miguel de Allende has been remodeled by Mexico’s National Institute of Anthropology and History (INAH) as part of Mexico’s Independence Bicentennial celebrations. City, MX; December 18th, 2009- Mexico’s Ministry of Tourism, the Navy, the State of Nayarit, the Mexico Tourism Board, Fonatur, (Mexico’s National Trust for the Promotion of Tourism) and the Mexican Sailing Association will head the official “Bicentennial Edition” of the Mexico Cup Regatta. This world class event will take place in Riviera Nayarit on February 27th to March 13th 2010, as part of Mexico’s Bicentennial Independence celebrations and centennial of the Mexican Revolution. This elite event will continue to position Mexico as the best destination for sail and sport fishing, while at the same time, promote the country’s tourism attractions on a national and international level. This magnificent event will bring together a variety of sectors within Mexico including the participation of government and private initiatives. The Mexico Cup Regatta will set international standards for sailing competitions, generating important benefits for the country’s tourism promotion and will also have an important impact within the international nautical community. As a result, the organizers and Sailing Associations involved have set forth more than 1,500 national and international athletes and support personnel to help make this event a success and position it as one of the most competitive events within the sailing spectrum, similar to those such as America’s Cup, Copa del Rey, Volvo Ocean Race and the Rolex Cup Racing. Participating in the official event presentation were, Ralph Nelles, President of the Mexican Sailing Federation, Oscar Fitch, CEO of the Mexico Tourism Board, Miguel Gomez, General Director of FONATUR, Bernardo de la Garza, General Director of the National Commission of Physical Culture and Sports; Jose Manuel Villalpando, Executive Programs Coordinator for the Bicentennial Independence and Centennial Mexican Revolution festivities Organizing Commission and Ernesto Amtmann, President of the Mexico Cup Regatta Organizing Committee. Carlos Ortega, Communications Director for Nextel Mexico said, “Over the past eleven years, since its initial start in Mexico, Nextel has positioned itself as a leader and supporter of a wide variety of sports. And on this monumental occasion, we are once again very proud to present such an amazing event that we are confident will be well received in both the sporting and tourism industries. ” Said Ortega. 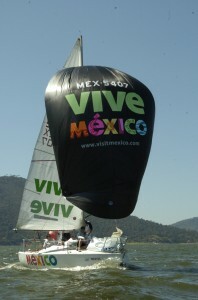 The Bicentennial Edition of the Mexican Cup will include five classes of vessel participation in each regatta: the Oceanic class, the J-24 class, the Windsurfing, the Kite-surfing and the Optimist, all guaranteed by the Mexican Sailing Federation and the International Sailing Federation (ISAF), in addition to the respective Mexican Associations for each class. The Regatta will take place in Bandera’s Bay, in front of the Riviera Nayarit coast; with distinct areas established by marked buoys that create different routes and distances that follow the guidelines for each class. For the Oceanica class, there will be routes of up to 35 nautical miles with different destinations, one to the Marietas Islands and another to The Caletas, located in the south zone of the second largest bay in the world, Bandera’s Bay. The Kite-surfing event, will take place in Bucerias, in front of the beach allowing the community to be included in this spectacular sport. During the first week of the event, February 27th to March 6th, the Oceanica Class and the Kite-surfing Class will participate, while the Optimist Class will take place at the end of the week, finishing on Saturday the 6th with an award dinner being held for each class. On Wednesday, March 10th, will be the initiation of activities for the J-24 Class, the participation of the Windsurfing Class will be incorporated, ending the event Saturday March 13th with the corresponding awards dinner for these classes. In the past, Mexico has been host to similar events in the sailing industry. In 2007, Bandera’s Bay played host to the J-24 World Championship, with teams from Brazil, Argentina, United States, Canada and Portugal. In 2008, this destination hosted the Mexican Circuit of Oceanica’s Regattas MEXORC, where vessels from the United States, Mexico and Canada participated and it will also host the Pan American Games in 2011. In addition to these events, the Mexico Cup Regatta will also have two other events; one will be the beach festival Mexico Cup with beach activities such as beach football tournaments and ladies beach volleyball tournaments that will include the participation of international teams. For these events, a stadium will be placed on the beach with a capacity for 2,500 spectators. The second event “2012 Challenge”, Tania Elias Calles will establish a Guinness World Record by sailing a Laser boat, which is a smaller sailboat, 300 nautical miles departing Los Cabos, B.C. Sur to Bahia de Banderas. The Mexico Cup Regatta will be celebrated biannually on a permanent basis, without a doubt boosting the sailing industry and help generate a tourism platform that will allow Mexico to take advantage and maximize it’s coastlines while steering promotional efforts and diversified activities towards those less explored such as nautical sports. AeroMexico named “Best Airline in Mexico” for 4th year in a row. We strive to always be at your service. HOUSTON, TX–(December 14, 2009) – For the fourth consecutive year, AeroMexico, the global airline of Latin America, has been selected as the “Best Airline in Mexico” for 2009 by the readers of Business Traveler magazine. AeroMexico has earned top honors in the “Best Airline in Mexico” category every year since the award began in 2006. Through this and other honors, AeroMexico has been recognized for its distinctive style of attentive, personalized in-flight service, which includes complimentary beverages, cocktails and complete meals. The airline has further distinguished itself with one of the world’s best on-time flight records, the highest safety and quality standards ratings, outstanding reliability and baggage handling performance, and exceptional value based on its competitive fares and superior service. This year marks the 21st annual “Best in Business Travel” awards at Business Traveler, a magazine that reaches 500,000 frequent domestic and international travelers. More than 4,000 readers of its U.S. edition were surveyed and asked to choose their favorite airlines, hotels, airports and other business-travel service providers in 55 categories. The survey consisted of open-ended questions with no suggested company names or choices given. To learn more about the “Best in Business Travel” awards, visit http://www.btusonline.com/, or for more information about AeroMexico, visit http://www.aeromexico.com/. AeroMexico and its subsidiary, AeroMexico Connect, operate more than 600 daily flights through the airline’s hub in the new Terminal 2 at Mexico City’s International Airport to more than 40 destinations in Mexico, 17 U.S. cities in 12 states, two cities in Canada, and 10 other destinations including Tokyo, Paris and Buenos Aires in nine other countries worldwide. U.S. cities served are Los Angeles, Ontario (Ca. ), San Diego, San Francisco, Seattle-Tacoma, Las Vegas, Phoenix, Albuquerque, Denver, San Antonio, Houston, New Orleans, Chicago, New York City, Orlando and Miami. AeroMexico Vacations provides customized vacation travel packages throughout the airline’s service network. The airline also offers connecting service to other international destinations through its SkyTeam global airline alliance with 10 other carriers. AeroMexico has been recognized for its award-winning style of personalized in-flight service, one of the world’s best on-time flight records, the highest safety and quality standards ratings, outstanding reliability and baggage handling performance, and exceptional value based on its competitive fares and superior service. Additional information is available at http://www.aeromexico.com/ or 1-800-237-6639.